From the first day of operation, the little things will be in order at a profitable Christmas tree lot. This takes planning. Use this Guide as a pre-season checklist, even if you have operated a lot in previous years. Unforeseen events almost always cost money. Although only for a very short period, you will be operating a business. Plan ahead and avoid expensive surprises. A good location for a short-term seasonal operation is the single most important factor influencing success. The ideal Christmas tree lot will be located on a road with lots of traffic, likely heading to, or coming from, a busy retail area. Drivers will be able to pull in from either side of the road after they identify the location as a Christmas tree lot. There will be sufficient firm-surface parking, clearly evident to customers. Electricity will be available, as will inside storage space. Take the time to check out alternative locations. Do your homework to determine your expected break- even sales volume before you commit to paying rent. Can you realistically achieve the required sales? If no formal lease agreement is to be signed, prepare a written list of the terms under which you are leasing. Get the owner to initial this list. Local by-laws may require that you buy a "transient trader" permit. Check with your agent on your liability insurance coverage for the location. 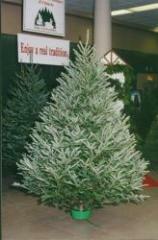 You need the right mix of tree size, varieties, quality, price ranges and accessory products. Why? Because only that mix will produce the highest per customer sale , to the largest number of consumers and thus maximize your profit. Unluckily this optimum mix is a moving target, which you can only hope to approximate. Check last year's competitors' advertisements, ask questions of wholesale sources, check catalogues and make an informed estimate. Plan on having about 10% of your trees left over, but do not over buy and see your profit disappear in unsold tree inventory. You will likely be able to locate and purchase some additional trees in mid-December, if sales are very good. Shop early. Narrow down your choice of possible suppliers by telephone, with the aid of the Christmas Tree Farmers of Ontario website - wholesale section. Large tree farms, as well as a growing number of smaller operations, will make timely Christmas tree shipments to almost any location. If at all possible, arrange to visit the farm where your trees will be harvested. Ask the grower to sell you tagged trees. The attractive tags "brand" each tree as an environmentally friendly farm grown product and can be used to price trees individually. Typical payment terms are a good-size deposit with your order and the balance in cash on delivery or pick-up. Check that the invoice or agreement details what you have agreed to buy. Be sure that you and the seller have the same interpretation, if tree grades are specified. There is no official Christmas tree grading system in Ontario. Besides offering trees, have at least a few accessory products available for sale. A tree stand would be a logical first choice. Prompted by the festive season, people stopping at your location will be there to spend money. Cater to their mood and increase your sale to each customer. Agree with the grower on a firm date for pick-up or delivery. Confirm the time the day before shipment. To ensure the freshest trees, the Christmas tree shipping season is very compressed. Be certain that you are on time, to help load, or unload, count and check the trees. Make written note on the bill of lading or the invoice of any shortages or damage. Ask the trucker to initial the note with you. The trucker will have no authority to make adjustments. Be safe and call the grower, if there is a possibility of a substantial disagreement over your purchase. Spruce trees are harvested last in Ontario, usually from the end of November onward. After harvest, proper tree storage is crucial for all varieties. Premature needle drop, normally caused by loss of moisture, is the most frequent complaint about a real tree. Please make sure your handling does not contribute to consumers switching to plastic trees. 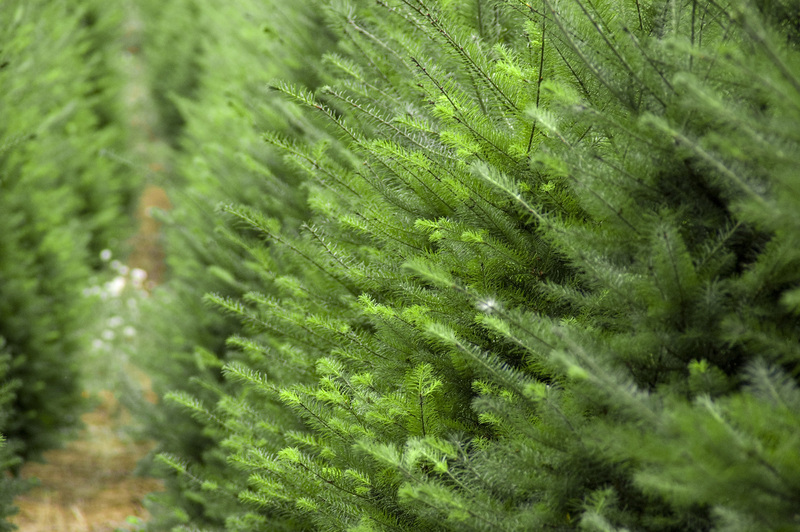 Unheated indoor storage will best preserve moisture, while protecting Christmas trees from ice or sleet damage. 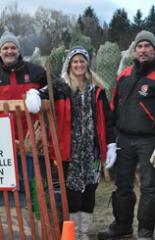 Alternatively, leave trees baled, storing them in the shade and out of the wind, until you are ready to display them. Trees grown in a warm climate will not tolerate freezing temperatures, in storage or transit. For this reason they are generally not brought into the colder regions. If practical, a person should stay at the Christmas tree lot each night. Good lighting and fencing around all displays and inventory will be necessary. Snow fencing makes the most practical temporary fence and also aids in directing customer traffic patterns. Displaying a "Guard Dog" sign will help. Once the season starts, make it your habit to frequently remove excess cash from the location. In Canada, plan to have your lot in full operation no later than the first Saturday in December. Remain open through Christmas eve. In the United States, many operators open before the U.S. Thanksgiving weekend, selling pumpkins and other products, then switch to trees without ever closing. Resist any temptation to close early and take home your profits. The late comers who are turned away will not have forgiven you by next year. Open each day well before the lunch hour. Otherwise, keep at least local retail hours, i.e. open until 9.00 pm each night. Make up a staffing schedule, planning for extra help during peak hours each day. Employ enthusiastic persons, who can radiate the festive season's atmosphere, no matter what the weather is like. Hold training sessions with your staff. Have a checklist of the features and benefits of each tree you carry. Require your staff to be able to easily discuss these with customers. Require your staff to "suggestive sell" "better" trees (i.e." more profitable"), as well as accessories, to each and every customer. Shake all long needled trees and any short needled trees containing debris, using a mechanical tree shaker, before handing it to the customer. Invest in a baling "cone", which will wrap a customer's bulky tree in netting. See that each tree is well secured to the customer's vehicle before it leaves your lot. Have twine available and offer to help as needed. Hand out a tree-care brochure with every sale. Merchandise your trees and other products with care. Display your trees individually. Placing trees in stands, hanging trees from an overhead structure, leaning trees against racks, or tying trees to a T-bar post, can all work. Fill empty display spaces from inventory as soon as they occur. Decorating several trees, if protection is available, can be very effective. Tree stands, wreaths and other products should be attractively and strategically displayed. Give your entire location a festive season ambiance, adding evening lighting, signage and banners as needed. Look through the "Wholesale Guide" for suppliers of products and ask your grower what he/she has available for you. The two basic approaches to pricing your trees are to have one price for every tree of a given variety and size, or to pre-price trees individually on tags. Mass merchandisers have opted for the first approach. It is the easiest to handle, but after the best trees are sold first, the one price may not look so attractive to the customer. With pre-pricing you can supply a tree for every budget, which neatly complements the individual attention your customers receive at your lot. With either approach, make sure that you achieve your overall target mark-up for the season. Don't forget to include an extra percentage to cover the trees likely to remain unsold Christmas Eve (these will be the least attractive trees). Do not reduce tree prices at the end of the season, unless absolutely forced to by operations similar to your own. Lowering prices will encourage customers to delay their purchase next year. It is difficult to compete with chain stores in the low-price segment of the Christmas tree retail market. The mass merchandisers' buying power allows them to purchase at very low prices. Fortunately, many people do not want to buy the lowest-price, no-frills Christmas tree to decorate their family or living room. Unless your tree source allows you to compete on price, your most profitable strategy will be to offer a clear alternative of quality trees, service, a wide choice and a traditional festive atmosphere. Some operators include low priced trees in their advertising, then try to up-sell price shoppers, once they arrive. Price individual trees to achieve your overall mark-up target. Add 30-50% to your cost of non-perishable merchandise. Studies have shown that within a town or city, most people who buy a Christmas tree from a retail lot, do so within a short radius from their home. Money spent on advertising and promotion will give you a maximum return, if it is aimed at people within the local area. If you are connected with a voluntary organization, it will pay to feature this prominently, both on location and in any promotion. A well-signed lot, in operation for a number of consecutive years, will need little additional publicity. You will not likely be so lucky. Many books are available on small business promotion strategies at the local library. You will have to develop your own workable strategy. Ask your grower for suggestions and ask what support he can offer. The grower will have access to material which promotes real trees and emphasizes their benefits to the environment. Christmas tree grower associations conduct promotional campaigns and your location can likely be included, at little or no cost to you. You will need to ask early in the season. Keep track of everything you do. Tree types, varieties, sizes, who buys what, quantities of each "accessory" sold and to whom, and so on. Develop a list of customer names and addresses, for a mail-out next season. All this information can be used and analyzed. It will allow you to do more things right next season. The successful operators are the ones who can take advantage of their prior years' experiences.